Sir Emeka Offor, of Nigeria, is chairman of the Chrome Group, a leading conglomerate in oil and gas services, power, logistics and telecommunications. A Rotarian, Offor is a member of the Arch C. Klumph Society, which honors those who give at least US$250,000 to the Foundation. On Monday, Offor announced he is giving another US$1 million to the Rotary Foundation for polio eradication. We caught up with Offor after his announcement at the PolioPlus Advocacy Workshop at the 2013 Rotary Convention in Lisbon. Rotary Voices: You arose from humble roots to establish yourself as a successful businessman. How did your upbringing help shape who you are? 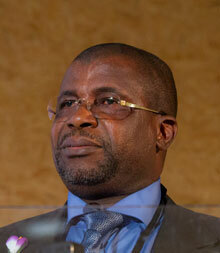 Sir Emeka Offor: I was born in the northeastern part of Nigeria in a little town in Cano state. My dad was a policeman. He was also a very hard disciplinarian. He made sure I did the right thing. At an early age, at 11 years, he sent me to live with my uncle, who was then a teacher. Teachers were seen as being good at molding a child’s behavior, so that is why my dad sent me to live with his younger brother, and I grew to learn right from wrong. And to be self-reliant. When I finished high school, I started in the asphalt business, and that continued into construction, fabrication, and eventually to where I am today. RV: You have given generously to a number of causes including in support of literacy, disease prevention, peace, and child and maternal health. You are the founder of the Sir Emeka Offor Foundation (SEOF). Why is giving important to you? Offor: I knew how I started my life, and I knew how I wanted to get to where I am now. And I knew it was a lot of hard work. My dad had to make many sacrifices to see that his young ones had a chance. After what my father went through, and what my entire family went through, I decided I must support the underprivileged in society, people who are not able to afford three square meals. People who can’t go to school. In our foundation, we have more than 5,000 widows we are taking care of, creating jobs for them, so they can fend for themselves. I want to help others escape the past I experienced. This is a goal that drives me each day. RV: You have been very generous to Rotary in the past, including contributions of more than $250,000 toThe Rotary Foundation. Why are you a supporter of the Foundation? Offor: I take pride in the good work that Rotary is doing. When I look at the programs of SEOF and I find that Rotary has a foundation that fits into what I want to achieve personally through my foundation, that’s why I extended my help and support to Rotary. Rotary has a wider reach and an international reach. RV: Why did you decide to give a new donation to PolioPlus? Offor: When I was growing up in Nigeria, a lot of my friends’ leaders died of various diseases that I did not know about. As I grew up, and became more enlightened I started knowing the causes and what diseases they were. I came across polio. If you go to Nigeria, you see children, adults, who can’t walk, they need support to walk. You can’t cure polio. We have to invest in preventing it. I hope that my means will inspire others to join the fight to end polio in Nigeria. RV: Nigeria is one of three countries were the polio virus is still endemic. What must be done to eradicate polio from your country? Offor: This terrible disease still exists in my country. At times the progress is slow. We have had security challenges, and other issues have complicated public health activity. Some parents refuse immunization for their children because they fear the perceived violence that has broken out against immunization workers. Last summer, we began activities to discover resistant populations and raise awareness. Rotarians from all parts of the country treat eradication of polio as a top priority. We are working to secure funding both from our own foundation and by reaching out to others to help, and we are using the model used in India which was successful in eradicating polio in that country. Polio can be eradicated in my country in my lifetime, and it will be. RV: How will you feel when polio is finally gone? Offor: When polio is finally gone, that day will be my most wonderful day. Having seen what polio has done in my country, to have polio eradicated in my lifetime will make me very happy. I am very grateful to God. This entry was posted in Convention, Eradicating polio and tagged 2013 RI Convention, Lisbon by Rotary International. Bookmark the permalink. My salute to Sir Emeka Offor and Thanks Sir towards the good work of Rotary wherein I am a smallest part from Dist 3190 Karnataka. May god give you everything on this earth. Thanks Sir E for this generous donation. I still remember vividly that evening when you were decorated as a Rotarian, I was confident that Rotary had caught a “big fish”. As the Chair Annual Giving for District 9140, 2012/10, you made my job easier and we exceeded our APF target far beyond expectation. Congratulations and may the good Lord reward you exceedingly. Great men create waves of action to make life better, for others. Thank you Sir Emeka Offor, of Nigeria. We are so proud to have you supporting our Rotary Foundation and our goal to eradicate Polio. You are an exemplary human being and a rotary member we take pride in knowing.